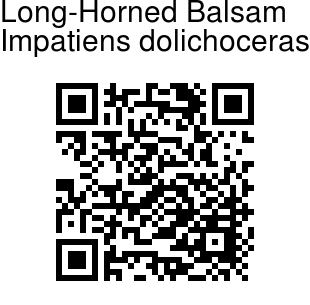 Long-Horned Balsam is an annual herb, 50-80 cm tall. Stem is erect, robust, long naked in lower part, branched or simple, with few supporting roots. Leaves are alternately arranged. Leaf-stalks are winged. Leaves are pale green below, sometimes turning purple when dry, green above, oblong-ovate or oblong-lanceshaped, 8-15 cm long, 2.5-4.5 cm wide, membranous, both surfaces hairless, margin toothed. Lateral veins are 6-8 pairs, curved, base wedge-shaped, narrowed into leaf-stalk. Tip is long-pointed. Flowers are borne in upper leaf axils, in 5-7-flowered racemes. The stalks carrying racemes are longer than leaf-stalks, 8-12 cm long. Flower-stalks are 1.5-2.5 cm, slender. Bracts are persistent, green, ovate or ovate-lanceolate, 5-7 × 2-3 mm. Flowers are yellow, purple spotted, 2.5-3 cm deep. Lateral sepals are 2, ovate, 4-5 × 2 mm. Lower sepal is purple-red spotted, boat-shaped, gradually narrowed into an incurved spur. Spur is long, about 1.5 cm, slender. Mouth is abruptly curved, tip long-pointed. Upper petal is boat-shaped, shorter than lower sepal, tip rounded, midvein thickened, crested. Lateral united petals are spotted, longer than upper petal, 2-lobed. Basal lobes are round, distal lobes narrowly linear, tip long-pointed. Filaments are linear, anthers ovoid, apex obtuse. Capsule is about 2.5 cm long. 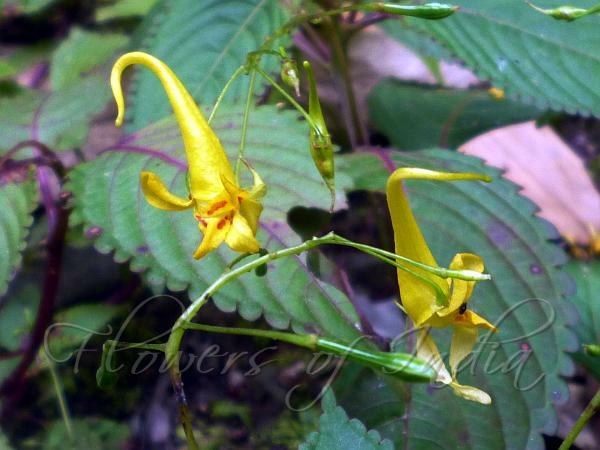 Long-Horned Balsam is found in China, and Arunachal Pradesh. Flowering: July-September. Photographed in Yazali, Arunachal Pradesh.